Will MSNBC be left out of the upcoming Apple Streaming TV Service? One major entertainment company not involved in the latest round of discussions is Comcast and its NBCUniversal entertainment group, the people said. Although the article focuses more on NBCUniversal’s entertainment channels, there’s one other channel in its lineup: the MSNBC news network. Apple’s not striking a deal with Comcast means that MSNBC would be excluded from Apple’s streaming service. The article indicates that Fox is included in the service, so, presumably, Fox News would be available. Dish TV’s Sling TV service includes CNN, so it’s not hard to envision Apple picking up CNN as well. That means, in the end, Apple could offer all the major Cable News networks except MSNBC. That’s the problem with being owned by a content distribution company — MSNBC could find what’s best for it (widest distribution across all channels) is at odds with what’s best for its parent (people sticking to cable TV), and MSNBC would end up the loser in that battle. Who watches Cable News show and how old are they? In May, 2014, Dylan Byers commented, without source (I presume Nielsen), that “The average Fox News viewer overall is 68.8, while the average ages of MSNBC and CNN viewers were 62.5 and 62.8, respectively.” The New York Times observed, in July 2013, “Just how old is [Fox News’] audience? It is impossible to be precise because Nielsen stops giving an exact figure for median age once it passes 65. But for six of the last eight years, Fox News has had a median age of 65-plus…” It goes on to say “MSNBC’s median age for its prime-time shows this year is 60.6; CNN’s is 59.8.”. Regardless, the average age doesn’t tell us a whole lot about the audience. Is the average age for Fox 68.8 because half the audience is in their 60s and the other half is in their 70s? Or because a large cohort or 30 year olds are balancing out a (larger) cohort of 80 year olds? 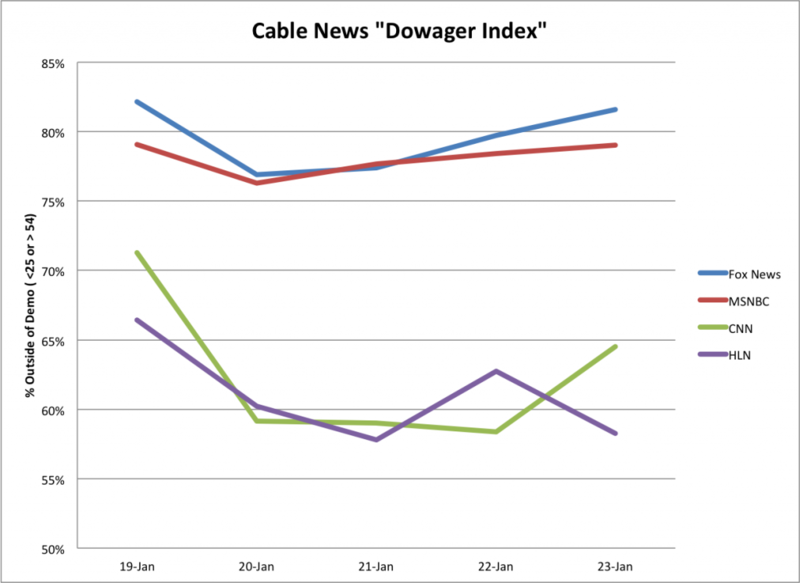 Fox News and MSNBC have almost an identical Dowager Index, while CNN’s and HLN’s audiences have a smaller Dowager component (and therefore a larger Whippersnapper component.) So all you Fox and MSNBC fans complaining about the other network are just old and crotchety. You can see that during the elections Fox News did better than the other networks, while in the aftermath of the Ferguson grand jury decision CNN did better. 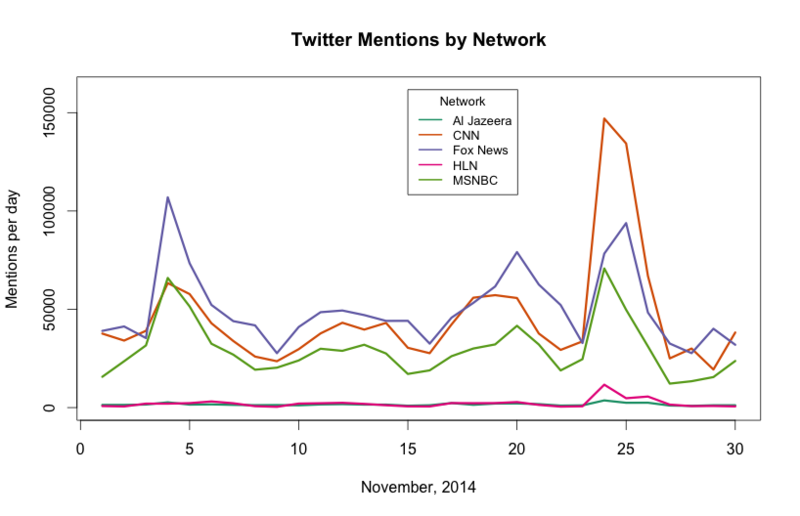 What can we learn about the Cable News networks by their fans’ Twitter clients? 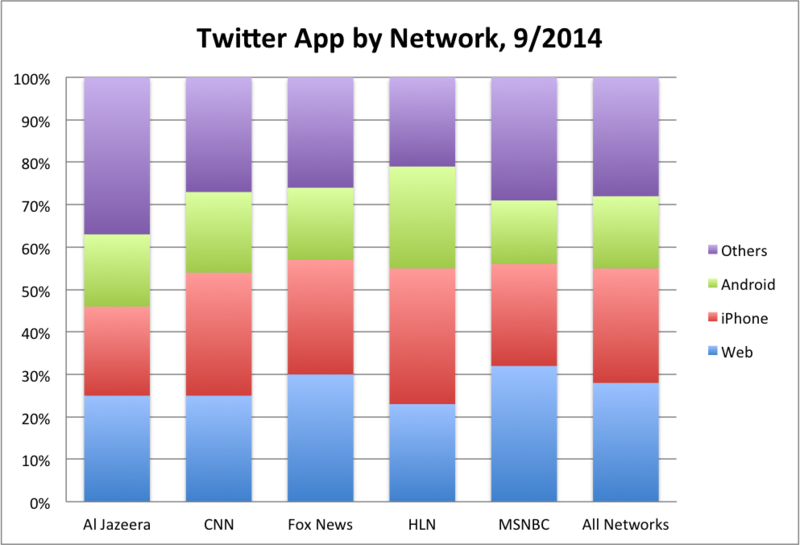 HLN’s mentioners were the most “mobile”. There’s not a lot of them, but they’re on their sofas, phone in hand. MSNBC’s were the least. Either they’re all watching MSNBC on their computer, or they’re on their sofas, laptop in lap. CNN was the most iPhone-ish. HLN was the most Android-ish (but more iPhone than Android). Foxers were slightly more likely to use an iPhone than MSNBCers. The web and iPhone are the most popular channels and about equal in usage. iPhone beats Android by about 3 to 2 overall. Windows Mobile sent about 1% of all tweets. Blackberries sent about 0.6%. To be fair, if you’re using the Microsoft Surface, it probably looks like web. The “Mobile Web” (that is, using the web from a mobile device) is tracked separately from “Web” (which, I presume, is non-mobile). And mobile web was about 1% of all tweets. People definitely are using native Twitter clients rather than logging into the web on their mobile devices. There were 4,332,044 tweets in total that were counted for this analysis. The idea of what is and what isn’t a cable news related tweet is not well defined. I have over 150 filters defined to catch the tweets, and I think I do a good job, but whether you think I do is another issue. I counted tweets, including retweets. Should I have counted unique senders? Should I have excluded retweets? Each of these is a reasonable suggestion and may well have changed the scoring. I could have missed some tweets, although probably not enough to change anything. So I think. Did AC 360 consistently beat Piers Morgan? Look, you can say that Piers, on general, got worse ratings than Anderson Cooper. Or you can say that I just happen to pick a few days where Piers did better than AC360. But you cannot say that Anderson Cooper always beat Piers. Because it’s factually wrong. Piers offered a qualitative judgement, which is arguable, but CNN offered a quantitative riposte which failed to check out.